Also known as financiers or friands, these almond-scented, bite-sized cakes are a perfect treat for a mid-morning or afternoon snack. They're prettiest when filled with fresh berries; but if looks aren't important, our Jammy Bits or a teaspoonful of jam work quite well, also. 60 mins. to 1 hrs 18 mins. Preheat the oven to 350°F. Lightly grease the cups of a mini-muffin pan. Scoop the batter into the prepared muffin cups (a tablespoon cookie scoop works well here). 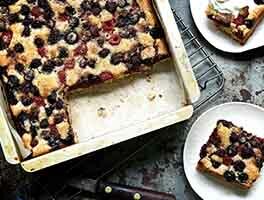 Top each cake with a fresh berry or two (or a sprinkle of Jammy Bits, or a dollop of jam). Yield: 26 to 30 tea cakes. Used KAF Ancient Grains in place of APF. Turned out well. Love these beautiful little cakes! I made it gluten free by substituting gluten free flour for the all purpose. I used very small milk chocolate wafers on half the cakes and blueberries and strawberries on the other half. I chopped the still-firm strawberries into small pieces, and added two tiny strawberry bits and one blueberry to each cake. They are so pretty! One other observation is that I made 24 mini muffin-size plus 4 bonus small ones. If I had filled the mini muffins any more, the batter would have run to the sides and not looked as nice (it happened on a couple) but that could be due to the GF flour. 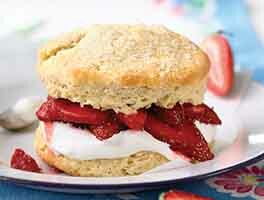 I will make these again and all the GF friends in my life will be particularly appreciative! 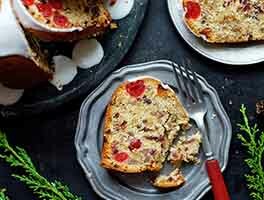 This is such a lovely recipe - perfect for a tea party and secretly perfect for gluten free folks. I typically make them gluten free with 1-1 GF flour because there's always someone who's thrilled, and flour is such a minor ingredient that it tastes the same. Raspberries are lovely in these, but my favorite is a tiny fresh/thawed blackberry, or part of a big one.The berry collapses into a filling, so in a pinch I've used a tiny dollop of jam. When I run out of honey, light brown sugar works, but isn't quite as nice. If they aren't going to be eaten promptly, I prefer using plain applesauce for half the butter as it keeps them moist. The recipe makes significantly more batter than fits in my mini muffin tin. 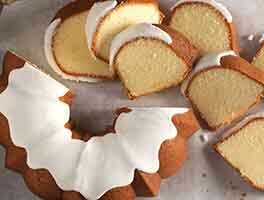 The mini muffins overflow so easily, but are so cute when they don't, that I end up making a tiny loaf of this. The loaf always over-browns around the edges before the middle is done, but tastes fabulous anyhow. Really great recipe. I ended up completely messing up the ratios (and omitting the honey) and they still came out delicious. These are delicious. I made exactly as indicated. Used both a mini-muffin and mini-tart pan ... don't bother with the latter. The depth is too shallow. They look like mini muffins but once you bite into it (or let's be honest ... pop it into your mouth in one bite) you'll notice the difference immediately. I added 2 fresh blueberries for each tart and they were perfect. Topped with powdered sugar for appearance only; definitely not needed for taste as they are very sweet (some might think too much ... but this is a cake after all). Next time will cut the sugar (but keep the honey). A winner! 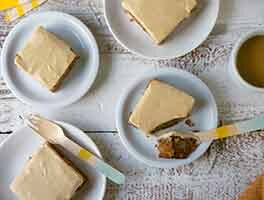 I came upon this recipe through serendipity. My wife's aunt makes something called tea cakes, which around here are these super thin crispy cookies, and on a whim I searched KA to see if they had a recipe. These are, obviously, very different from what I hoped to find. But I had some almond flour on hand, so I decided to give them a shot. I'm very glad I did. They didn't last more than two days. Perfect flavor and the texture is addictive. My only complaint is that using five eggs for just the whites seems wasteful. I wonder if there's a way to substitute whole eggs. These little cakes are delicious. I have baked them twice. I followed recipe and baked in a mini loaf pan. I skipped the berry topping and only dusted with powdered sugar. "The best thing you've ever baked" from a coworker who bakes. I prefer a small blackberry to a raspberry in these, but both are lovely. I was surprised that we don't like strawberries or chocolate chips in these. If using egg beaters, use 5oz which is 5/8 of a cup. I had to call the baker's hotline far too early in the morning for help with that. Made them with my four year old and he had a great time inventing different jam concotions. We tried different jellies, small chunked fruit and chocolate chips. I don't have a mini muffin pan so used a regular one and it turned out fine. Just added a bit of time to the baking.